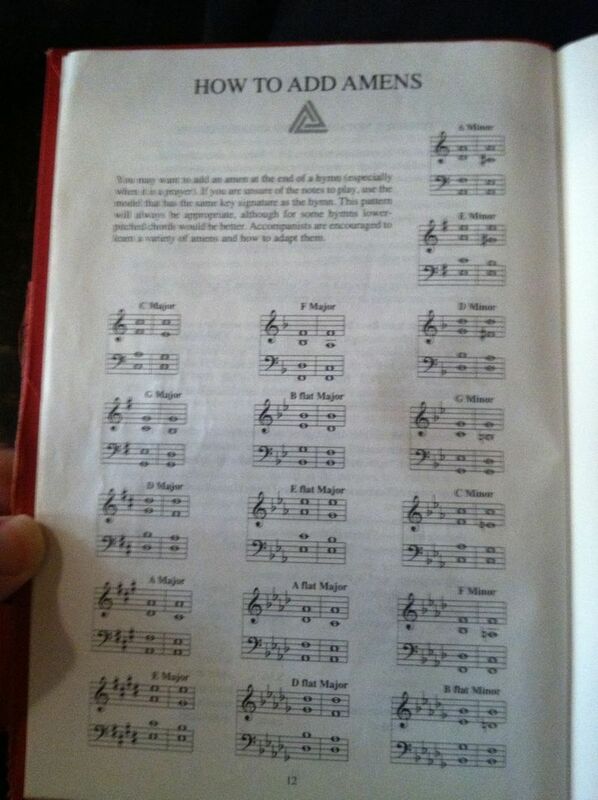 Steve Seward tweeted this today and linked to a realling inteesting chart to me. Follow the link to the chart to take a look at it. I am not sure about copyrights on the whole situation so I am not putting it here. I really like the idea of making sure the focus of a coaching conversation is on student work and the formative assessment data you and the teacher are looking at. It really starts to drive the conversation is a safe and comfortable direction. What changes might you make to your coaching that are informed by this chart? I find this video very interesting. I thought I would share it with you and see if you have done this before. If I make the time, I would like to do this for my communication with parents. Very interesting indeed. Think about the workshop standards based grading method that we talked about earlier. Instead of a blank to type in your comments you could have the eight teaching points from the unit in your form, check box style. During the day as you conference you walk with your iPad around and have the form up. Click the kids name. Check any mastery boxes that you notice as you confer with the student. At the end of the day you have a record of which kids you conferred with and what demonstration you have seen from each one. You have typed almost nothing, communicated clearly with students and parents what they have demonstrated. You could also have a section next step suggestions, including some videos for reviewing teaching points for kids who have not mastered anything and some advanced teaching points for kids to go deeper on. I like this so much I invented a sample letter. Today you demonstrated good use of commas. You demonstrated correct use of quotations to support an argument. Thank you for the work you did to learn and practice these skills. While not required, an idea for honing your craft of writing is using more vivid verbs. Your current project could really benefit from this. You have not demonstrated proper capitalization yet, even though this is an expectation of the unit. Here is a link to a video** demonstrating what was taught and is expected. *At the high school level I would be sure to include kids in the communication. In fact I would write the email to the kid and CC the parents, rather than writing right to the parents. This continually reinforces that the responsibility is with the student. **Any video links I would send with a bit.ly or goo.gl short link so that you could gather stats on whether parents were clicking them. I had the opportunity almost a year ago to go to Capturing Kids Hearts. This was one of the best learning opportunities I have had as an adult. Three different areas were activated over the days: I learned deeply about myself, I learned about how to connect with those I teach, and I learned how to better facilitate with adults. If I had not followed this up by going to Cognitive Coaching I would say CKH would be the most recommended professional learning I had been to. Today I ran across my notes from the event. Here are the highlights from them as I review them. "All people are motivated by... something." Our leader was asked what are the top needs of all people, he said, "First to feel connected and second to be successful." Be less helpful but surround with support and great things. This will encourage individual responsibility. ]]> Jim Peterson tag:weathertation.posthaven.com,2013:Post/639881 2014-01-09T16:27:19Z 2014-01-09T16:27:19Z What is school for? Below is the text of a snow day email between me, a trained physics teacher, and one of our art teachers. Three or four times a year we have conversations like this. I thought I would share one. hoping we can do some of this out of school learning IN school too! The article was fascinating to me. I obviously love some of the things said. What I thought was really great was his emphasis on collaboration. But then I thought this about school and adults looking back on school as opposed to students thinking about school right now. An adult has at some point learned the need to collaborate and how to invite others into collaboration and where that is appropriate. At school what we do, or what we should do, is invite students to collaborate with us and show them how people that think a certain way collaborate, solve problems together, and generally get along. You do this in an art way, and I do this in a science way, but we both do this in a teaching way, and we do it in a Christian way. Frank Smith painted this beautiful picture for me of welcoming kids to the club. The club of painters or modern physicists. Welcome. So you want to be a painter? This is what painters do. This is how painters relate. This is how painters collaborate. This is how painters disagree. This is how painters solve problems. Most importantly, welcome, we painters are glad you are here. School is the intersection of loving experts and vulnerable hungry learners who do not know yet how to figure out who is a loving expert and who is just an expert. Sorry about the morning philosophy. "school is the intersection of loving experts and vulnerable hungry learners who do not know yet how to figure out who is a loving expert and who is just an expert." I love your quote too...and how to navigate a world when the experts stop being loving and learners are still feeling vulnerable...phew. I am thankful to Mer for keeping me on my toes. I wrote down these notes when listening to Drew VandenHeuvel's presentation to the Global Physics Department. He is a genius who happened to student teach with me. I learned a lot. For a scale I wondered if there was something commercially available that were good enough for your students to use, like a food scale that all Meijer would have or something they could get from Amazon. I read of a teacher recently who used all online textbooks for readings and the like, and instead of putting a book list together made a equipment list so each student had these items for class. If you required an iPad for the course you could use apps like Screen Chomp, Explain Everything, or Educreations for problem explanations. There must be Android equivalents of these apps. As soon as you require a tablet, you can also assume they have a camera. Cameras should be huge in making online physics instruction come alive. Could you somehow take advantage of the fact that all your kids are in different places to make a single lab that required data from all the students to make the final lab data that is evaluated? I read this idea somewhere, but I forget where. 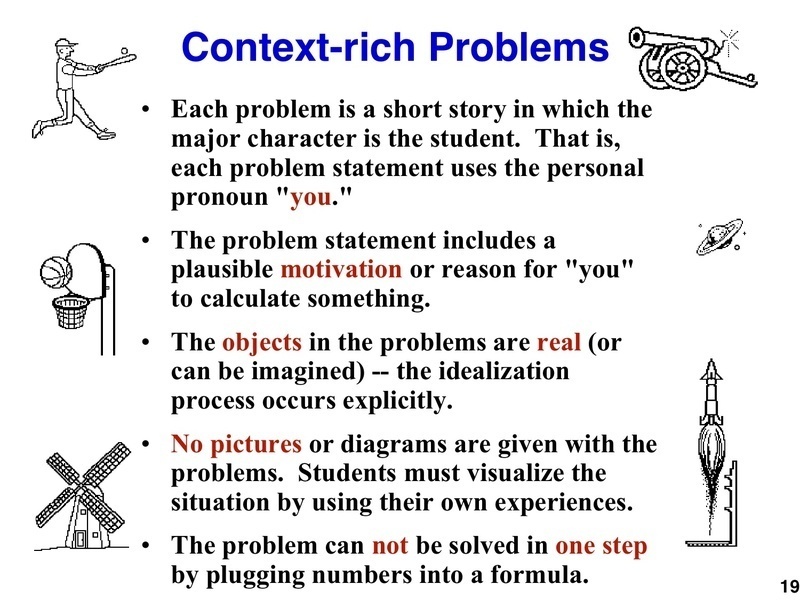 Finally, I am reminded of the attached screen shot of a presentation by Ken Heller about Context Rich Problems at the Global Physics Department. Having students make problems for each other seems like a way of increasing engagement with each other online. If we move to have students make problems as part of their understanding what role to Heller's rules have for students? Do you know how your English teachers grade papers? Do they do that with printed copy on paper, or do they do this online? If so, is there a software you use? We are at this point all over the board, but I think we fall into three camps: all online with the UploadPDF tool in Moodle, all online (may be the final printed) using Google Docs, and computer creation with paper turn in for feedback. We are also having a pretty deep discussion with the pilot Writing Workshop group about wether to put grades on papers. For that discussion we are using a book called, Rethinking Rubrics. For a sample of the direction that would take us in see Moving Beyond Judgement upon which the book relies for the heart of its solutions. 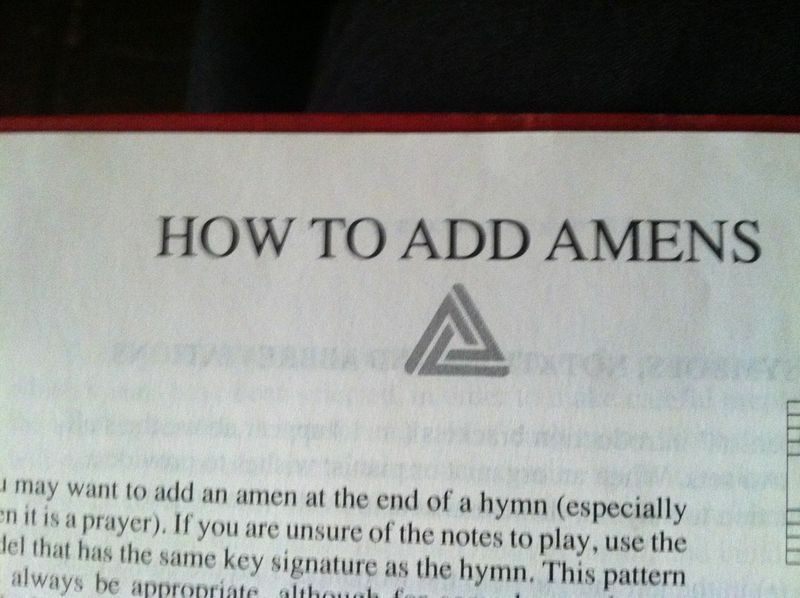 This page, photographed from the Trinity Hymnal, struck me as funny when I first saw it, then eventually I thought it was sad. Since then I have rested on this page as a reminder. 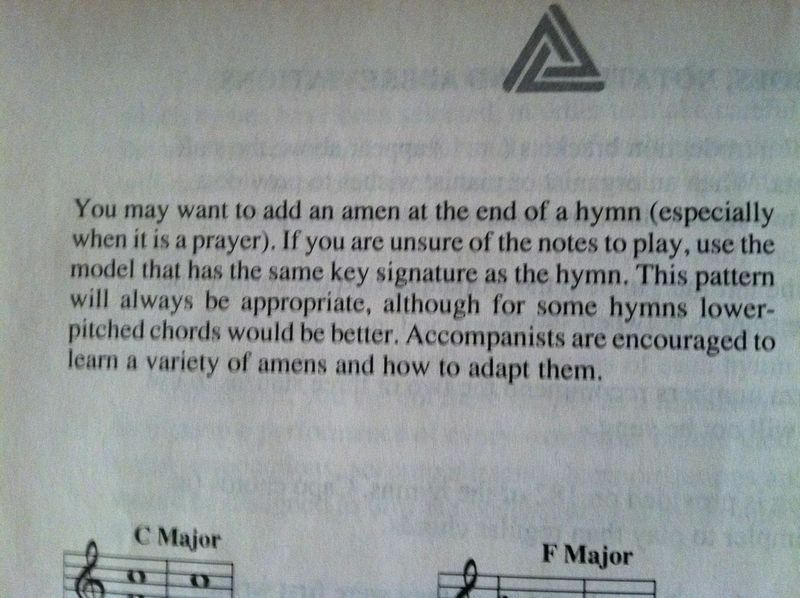 Someone thought adding Amen to the end of every hymn was good, and that it needed to be done well, so they did research and found best practices on how to add amens. This page reminds me that there is always going to be a tension between pure creativity and pure, structured, research based, strategies. To hold this paradox we need occupy, at times, both worlds. The option that strikes me as least interesting and effective is ignoring both ends of the paradox and trying to walk the middle. ]]> Jim Peterson tag:weathertation.posthaven.com,2013:Post/324735 2012-08-13T14:49:13Z 2013-10-08T16:30:58Z What Is Leadership? I spent the better part of two days watching the Global Leadership Summit at a satellite location. I have three reflections. I am not sure that we should abstract leadership as something to study. Everyone that spoke had a different measure of what made great leaders. No theme became evident. Having been to the summit before and read several books and articles in the last couple of years on leadership, to me no unifying theme has emerged. One feeling has emerged. I am less and less confident of my leadership ability the more I hear about leadership. I should probably stop learning about leading. Leaders learn. Mostly by listening and other less important means. Leaders do something. The something is probably new in their environment and based on their learning. There are not certain outcomes. My best thoughts after the summit circle around values. I think I am merging thoughts from Jim Collins and Patrick Lencioni. I have spent a lot of time reflecting on what simply stated core values inform all our decisions. I have spent more time thinking about how we communicate them to the community. We have core values that guide most of our decisions, but they could be clearer. I also woud like to see us empower more people to use simply stated core values to make decisions. I have also been noodling around about my own simply stated personal core values. I am ready for there to be more people around so I can listen to them. Then I can do something. ]]> Jim Peterson tag:weathertation.posthaven.com,2013:Post/324767 2012-08-13T13:46:34Z 2013-10-08T16:30:59Z “We do not have to deny or avoid our loneliness, our hostilities and illusions." I spent a lot of the morning thinking about school and how I am not in control of it (or anything else for that matter). I was worried. Then I sat down and read the words above. I am not in control. The world does not have anyone's best interest in mind. I do not have to fear. What is the most important/useful object you've brought into your classroom? Short answer: Laptop and projector. Long answer: For years I had a coffee can with a rubber band through the top and bottom and a 500g mass hanging from the rubber band. I called it the can of wonder. Once or twice a week when students were walking in I would roll this can up the middle of the room and it would roll back to me. We did not study this for months, but it built up an expectation that wondering and questions and the unexpected were going to happen. My absolute favorite question to ask (and you can do this on scrap paper, in a public forum, in a private assignment depending on your needs) is, "What did you hear today?" This question cuts through the your expectations and their nervousness about being right and asks them to report without value what went through their head. I always learn from the answers. Right when they ask for it, not when you think they need it. It took me years to figure out that if a student came up to me during a test and could not figure out a question and really wanted to know the answer now I had a teachable moment that I had to use. Now I take them a little out of earshot and explain. What would you tell your first-year-teacher self to STOP doing? What would you tell your first-year-teacher self to START doing? They did not exist then, but reading blogs about teaching and at least lurking in the greater world of teaching and learning and physics. I guess I did this by joining AAPT, NSTA and MiAAPT and going to conventions and in the Michigan meetings. ]]> Jim Peterson tag:weathertation.posthaven.com,2013:Post/324861 2012-07-19T18:54:00Z 2013-10-08T16:31:00Z Really? More Test Scores? Is That All There Is? I attended the Model Schools Conference two weeks ago. It was quite a gathering and there were a lot of challenging and inspirational speeches. The sessions are led by one of four groups of people, Model Schools Consultants, school employees of found model schools, school employees of created model schools, and corporate conference sponsors (these were noted in the program). The conference impressed me in a lot of ways. Presentations across the days and topics had very similar formats. It was obvious to me that behind the scenes all presenters had been given tips and tricks and encouraged to follow them. Presentations started with objectives. Many worked off the same template, even if they were not a consultant. Presenters referred to research, although they could have cited it more often. Finally, and to me most noticeably, presenters gave evidence of success. The success is what made me scratch my head. It was test scores. A few places here and there were stories, but the exciting results were better test scores. If education reform is going to succeed at anything but standardized students it needs to figure out a way to simply present success without showing test scores. If that is all we show off computers will replaces teachers completely. Teachers are important. Caring people do a better job of bringing out the individual strengths of others than bland technology. Relationships welcome new members into the club of readers and writers and physicists better than any computer can. Interested people bring out the strengths in others quicker and better than disinterested technology. If we want education to look truly different, which many of the people at Model Schools did, we have to stop reporting results in the currency of old schools education: test scores. ]]> Jim Peterson tag:weathertation.posthaven.com,2013:Post/324907 2012-07-16T20:10:02Z 2013-10-08T16:31:01Z Can you really become fluent in something you do not want to be fluent in? One theme of the model schools conference this year was the uptake of schools on game based learning. Their definition of game based learning is drill and kill made fun. I think the exact quote is, "Games make repetition and volume fun." There are other definitions of game based learning that I am more excited about, but I became much more impressed with the underlying ideas as the conference went on. Two advantages of computer based games really caught my attention. Return to areas of safety and detecting the use of working memory for basic facts. Back when I first played video games, which I do not do hardly ever anymore, when your lives were up you set back to zero. That is not the case anymore. Good games take you back to your spot of safety, the place that you can confidently conquer. One of the reasons I gave up on games was the infinite boredom of reconquering levels. The argument in education goes like this. If a teacher knows you do not have your multiplication facts down you get a worksheet with all of them. A computer only gives you the ones you need and enough others that you have success and stay interested. This makes for more targeted and more efficient use of student time, something I am in favor of. The speaker also went on to say that based on time to answer games could make decisions about whether or not a student was using working memory or long term memory to solve a problem, long term memory being the goal. If a student is pulling necessary information, like a math fact, our of long term memory then they are fluent and can solve more complicated problems. If we know this has happened we can stop wasting their time with practice they do not need. This is a good thing. I wonder if, when a student wants to overcome a barrier, a teacher could hand them the right game based tool to really advance their fluency in an area. The argument goes that this frees the teacher to focus on making the classroom more rigorous and relevant and it also frees the student from tons of monotony and exchanges it for focused targeted learning. More time on the not boring stuff seems good to me, and if a teacher can increase the amount of relationship in their class because basic skills are effectively and efficiently taught, that also seems good to me. What seems bad is the likely unthinking application of these tools upon kids that have not found the hook to learning a skill yet. Then it will be just as boring at the fortieth game of Pac Man, or in today's case Fruit Ninja. Getting the student to want to be fluent seems to be the big hurdle to using the tools well. ]]> Jim Peterson tag:weathertation.posthaven.com,2013:Post/324959 2012-06-21T14:03:00Z 2013-10-08T16:31:02Z Measuring the creative use of laptops in the classrooms. measure and create a metric for is creativity and creative expression. both. Right now we are using Google Docs/drive. Good to hear from you. I hope your summer is going well. I have little systematic in place yet. It was always my dream, but there were never resources to give a creativity test of some kind. A commonly used test is the Torrance Tests of Creative Thinking. I do wonder if it would be easy enough to make your own test that you interpret. You could even administer a fairly simple question to every student twice a year: for two minutes write down all the things that you could do with a brick that a brick was not meant to do. Change the noun every time, or every three years so no one middle school student gets a repeat, or every test so the first month of sixth grade is always a brick. Tag the posts with their grade and graduation year, and allow anyone to make judgements about improved creativity by sorting through the posts. I wonder a little about the power of just collecting the data and allowing the interested parties to make their own conclusions about the data. I think that an ePortfolio of work collected by teachers over the years will show the gains you are looking for. We set this up as a group blog that everyone has the ability to write posts for. We use our own internal blog server, but you could use Blogger or Posterous as well. Posterous would be best, but I am not sure what the future of it is as a long term storage place. I have looked into Maraha and have not yet had the technical knowledge to make it happen. One thing that has helped me when thinking about ePortfolios is realizing that each student and teacher will be involved in several and there might be more than one best place for all these. For this creative piece you want a portfolio put together by teachers for the three to five lessons a year that they thought produced the best creativity. You then want them to post the assignment, a range of example product without names (making sure that a low and a middle response are included along with several high examples) and some reflective work by the teacher on why they thought these things. Over time you should see the creativity of the assignments go up and the responses, two things you can track qualitatively. In the first part of the answer to this I suggested a student contributed portfolio. Both portfolios have district rather than classroom or personal goals. It will be important in either case to admit that upfront. What do you think? What would be convincing to your committee? Do they want the comfort of numbers that will always be an incomplete picture or are they OK with the messiness of subjective data? ]]> Jim Peterson tag:weathertation.posthaven.com,2013:Post/325006 2012-05-18T01:01:30Z 2013-10-08T16:31:02Z What do you do for advanced Moodle users in PD? Any suggestions for pd homework so my Moodle high flyers don't get bored? This is a great question. I have a few quick options off the top of my head. Explore the MoodleNews blog there are tons of little articles about the cool features of Moodle there. Explore features in the Moodle Documentation that are advanced but cool. I would recommend starting with Glossary, Workshop, Conditional, Social Topics Course Format, Choices, and Wiki. Also the Moodle Documentation pages on philosophy and pedagogy are great reading and help you start to understand not only Moodle, but how technology can changes teaching and learning. I put this list from the pedagogy page in front of my staff every year. I ask them to reflect on where they were and where they are now and where they would like to go. I wish I had them write down those reflection every year, it would have been a powerful assessment of the program. Around The Corner is another good blog with a lot about Moodle. Explore. Another challenge I give teachers at workshops is to think how it would change their assignments if student had to post the answers in a public forum. This starts to get at the changes we would like to see in student work where they have to write responses to our creative prompts that are unique to them. I am not sure I would teach this again, but it is compelling for some teachers. Have them look over the quiz question import tools and experiment with importing questions. Better yet, have them prepare a presentation on importing questions and share it with the faculty. I hope some of this helps. Moodle has been invaluable in our transition to a digital environment. ]]> Jim Peterson tag:weathertation.posthaven.com,2013:Post/325060 2012-05-08T11:32:36Z 2013-10-08T16:31:03Z "Beauty does not linger, it only visits"
"Beauty does not linger, it only visits." From Beauty: The Invisible Embrace (rediscovering the true sources of compassion, serenity, and hope) by John O'Donohue. How much energy is wasted trying to make permanent something that is ruined by permanence? The beauty of teaching is in the moment where a student is changed, truly changed for life. Much is written about making students more engaged and certainly an engaged student is better off than one that is not. It is truly impossible to teach a student that is drunk or high or otherwise impossible somewhere else while still being in your room. That said the beauty will still be in the moments, not in the day to day. The better we do the day to day the more likely the moments are to come, but by their very nature these moments do not linger. I recently gave an iPad training for a school that has teachers with iPads. One of the tools I showed them was zapd, an iPhone app, that creates simple web sites. To this group of teacher, some of whom are relatively new to iOS, this was a really fun and interesting app for them to play with. In the interest of using he tools, I created my presentation for the morning using zapd. It served as a great holding place for links, pictures that went with stories and text boxes with assignments. ]]> Jim Peterson tag:weathertation.posthaven.com,2013:Post/325142 2012-03-22T16:01:00Z 2013-10-08T16:31:04Z How do I use one iPad in a classroom? I have a teacher here at Byron that would like to control his Mac with his iPad so he can walk around the room. I don't remember the apps/setup to do this. Was this the same app that allowed the iPad to be a web server too? Or was that a different app? Most success, easiest setup, cheapest, but does not control the computer: AirSketch. More expensive, controls (but not a lot of teachers use that part), has awesome presentation mode: Doceri. Like Doceri and very promising, but for us has been buggy: Splashtop. This was also the one I heard about the most at MACUL. True control but no integrated presenter mode: MobileMouse. Interesting with an iPad 2 or 3 and an Apple TV: Skitch. I have used Skitch on my mac with a Bluetooth tablet as my sole presenting tool for years. With AirPlay it could be awesome. ]]> Jim Peterson tag:weathertation.posthaven.com,2013:Post/325172 2012-03-12T16:49:23Z 2013-10-08T16:31:05Z My dad asked me about Kahn Academy. We saw a segment on 60 Minutes on Khan Academy. It's an organization that puts teaching segments on the internet for anyone to use. They are on all kinds of subjects. It could be something to look into especially with your unhappiness with textbooks. I have used some of his videos in class for review and the like. I struggle sometimes with what the role of a teacher is in the new world that is unfolding before us. I also wonder what the difference between Kahn and a textbook is. All the same stuff is in a textbook, but if you are not motivated to learn and express your learning you won't. Here is an excellent blog article on the Kahn Academy that has a lot of links to articles critical not of the videos but of how they are likely to be used and all the attention he is getting. Frank is a excellent physics teacher. If you want an interesting read that goes much deeper into the education issues that Kahn Academy brings up I would encourage you to check out this free eBook called Stop Stealing Dreams [PDF]. There are other versions for downloading and printing. It is an easy to read summary of why Kahn Academy is just the last of the old way of schooling while still being an important but tiny piece of the future of education as well. ]]> Jim Peterson tag:weathertation.posthaven.com,2013:Post/325211 2012-03-10T20:18:28Z 2013-10-08T16:31:05Z Ideas for short tech PD, then give teachers time to brainstorm and explore. convention for me. I tried to avoid the "how to use this tech tool"
send me three or four topics that you recently used in those sessions? I'd like to give it a try in my district before the end of the year. Good to hear from you. If I can be of any other assistance please tell me. To answer you question about Tech Tips and Treats, here is my list straight out of my notes. We have moved to more of an every other week schedule this year. We also do celebrations of awesome student work. DONE - New/Updated blocks, including the drag and drop upload and comment block. Moodle 2.2 Workshop Module: all the same goodness with more stability. Gosoapbox google moderator on steroids. Today I did a presentation entitled Creating A Culture Of Learning. The slides should be posted below. I thought it went well. If you look at the slides you find that I tried to set up a situation where I grounded some of our initiatives in a theory I am working through called conditions of the 21st century. I hate the buzzword, but I think there are some things that are different and am trying to base some of the things that we have found successful in the changing landscape to the world. I will gladly talk to anyone about the presentation, leave a comment. If you were at the presentation and have not already please leave me some feedback, either in the comments here or in the form. Also, if you were there I gathered a lot of other ideas about conditions of the 21st century from you and the link timed out and I lost them, so if you remember yours add it to the comments here. Thanks a ton. There are a lot of links in the presentation and I think that Slideshare.net maintains those. ]]> Jim Peterson tag:weathertation.posthaven.com,2013:Post/325305 2012-03-01T02:54:22Z 2013-10-08T16:31:07Z Start the year by figuring out what the question is. Somehow over a month has past since I initially wanted to respond. Anyway, do you have electronic copies of the articles you use at the beginning of the year? We used this activity, followed by a study of Matthew 25, followed by this activity with the linked articles below. Big news about energy has been happening in Holland over the last year. You will be put into a group that will read an article about this issue. Discuss the article with your group and be prepared to share what your group says with others in the class. The person with the most white on their shoes today is the group scribe. The State of Michigan Sued! Then we asked the students this: what big questions does a group of people in Holland need answered. This is the list the students came up with and the classes choose one as our question for the year. ]]> Jim Peterson tag:weathertation.posthaven.com,2013:Post/325343 2012-02-28T02:41:06Z 2013-10-08T16:31:07Z We need to know what we do not know. I continue to think about the conditions of the twenty-first century. I think conditions is the right word, because the skills we need are not different. The conditions under which we are called to use those skills are. Here is my list of conditions, to date. Everyone builds capacity (since I wrote that I thought may be everyone improves would have been better). You have to be open to what you do not know. Everyone needs to be reflective. Everyone has to manage their connectedness. So here goes an attempt to describe why we have to be open to what we do not know. Today in chapel they showed two videos. Much has been made of the first including a column in the august New York Times. The column supposes the old way of learning and knowing: careful study, long hours of research, and grounded arguments. I am not sure this cuts it anymore. Facebook is famous for the phrase, "done is better than perfect." Jeff Bethke seems to have been unintentionally doing this same thing writ large. He had an idea. He was open to what he did not know about it. People have responded. He is growing, and so are many people with him. In science we are taught, way too late I think, that journals filled with publications are a conversation. Researchers dancing slowly around the truth poking holes in each others research and ideas and advancing their own. This process can be seen on Twitter nearly every minute of the day. We have to know what we know and test it. And then be open to correction and advancement of our ideas. We need to hold strong where we are experts, in the face of trolls and naysayers, and keep the conversation moving. We need to know what we know and be able to listen to and be open to what other people know. We also need to be able to test those people and what they know as well. And perhaps the most important part of all this is that we need to all know how to do this. Not just the scientist or the academic. Because the content is so easy to find and so easy to fake everyone needs to be able to dig. ]]> Jim Peterson tag:weathertation.posthaven.com,2013:Post/325403 2012-02-07T01:49:06Z 2013-10-08T16:31:08Z Who is the leader around here? I have continued to think about the conditions of the twenty-first century. If I were a better blogger and writer I would have split the last post into two posts and had the whole list, but that is not the way I role. I think conditions is the right word, because the skills we need are not different. The conditions under which we are called to use those skills are. Here is my list of conditions, to date. You have to know what you do not know. So who is the leader around here? Teachers need to lead students, not boss them around. This can only be done if you yourself are moving somewhere and going somewhere. It can only be done if you are exploring, feeling out how what the world is like in the context of your subject. Teachers need to be leaders among their peers. They need to take charge of a grade level or department goal and lead the group in the direction that the school mission statement directs. Teachers also need to build into the others on their teams the capacity to lead where they do not have the right resources to lead. Teacher need to graciously accept that there are times when they need to be led. Who might they be led by? Other teachers. Administrators. School boards and parents. Most importantly they need to build the capacity of leadership into their students by following their students. I hate to say that we need to build leaders, because I have a mushy feeling that there is no such thing as leadership. There is just doing and not doing. That said we need to create people in schools that are doing and keep doing right from the start. Then they will lead, students, teachers, and administrators. One of the best ways a teacher can do this is to follow the lead of a student. Everyone needs to lead, and everyone needs to be open to being led. This is the twenty-first century. ]]> Jim Peterson tag:weathertation.posthaven.com,2013:Post/325439 2012-02-03T16:11:42Z 2013-10-08T16:31:08Z Let the students write the standards. This year we throw students into an inquiry on day one of a unit. We go for a few days, even a week with a goal for the inquiry but almost no physics words surrounding the goal. Eventually we invite the textbook and a problem set into the classroom. The day after that we give the students a list of standards, some from lists I made with another teacher, some from the state and some from other physics teachers who have published their standards. Predict how the electric force between charged objects varies when the distance between them and/or the magnitude of charges change. Explain why acquiring a large excess static charge (e.g., pulling off a wool cap, touching a Van de Graaff generator, combing) affects your hair. Charged objects can attract electrically neutral objects by induction. Draw the redistribution of electric charges on a neutral object when a charged object is brought near. Identify examples of induced static charges. Explain why an attractive force results from bringing a charged object near a neutral object. Determine the new electric force on charged objects after they touch and are then separated. Propose a mechanism based on electric forces to explain current flow in an electric circuit. They gave us this list to choose from after running these through the filter of their inquiry, readings, and listening in class. Be able to create enough static electricity to make a balloon stay in the air for more than 30 seconds. Be able to use Coulombs law for real life situations. Calculate the force when you're given the two charges and the distance between the charges. Be able to use Coulomb's Law to determine force when given a graph. Know how to use Coulomb's Law in context. Know what causes static electricity. Be able to identify/recognize induction and conduction in real-life events. Be able to calculate force, charge, and distance using Coulomb's law. Coulomb's Law: be able to apply it in situations that you could encounter daily. Be able to explain what makes something negatively charged, positively charged, and where the energy goes once touched against something. Be able to shock someone. Each individual should be able to conduct their own electrostatic experiment and be able to measure the force. Be able to understand your static electricity knowledge by giving a demonstration of static electricity. Know how to use Coulomb's Law in real life situations. We loved all the highlighted ones, laughed at the bold one and picked the blue ones. We have crafted more lessons based on these student chosen standards so that they can make progress towards these goals. There are things we never would have thought of in here that motivate students to really dig into the topics. ]]> Jim Peterson tag:weathertation.posthaven.com,2013:Post/325484 2012-01-18T14:48:26Z 2013-10-08T16:31:09Z How many hits on YouTube should a student video get? For the last unit of physics this semester we worked with the local utility to produce a list of businesses that had used municipal dollars to reduce their energy use. The students then went out in groups to interview the business owners and had to make a short video promoting the energy saving changes the businesses made. I am a physics teacher. My goal was not making videos, my goal was awareness of the program and the rather active community of energy savers our small town has. I wanted awareness for my students in the context of their study of energy and awareness for the community at large. The project also dovetails with a local video contest going on. So instead of all kinds of rubrics about the quality of the video my co-teacher and decided that one of the standards for the unit would be, "Students video will get X hits on YouTube." We negotiated X with the students. We opened with 200, and they talked us down to 90. Do you think people will want to watch it to the end? Do you think your title is good enough to make someone watch? Would you want to watch this 90 times to achieve the standard? Would you watch a YouTube over 3 minutes? All of the crazy detail questions that you get are answered by the students when you put it in practical terms. I loved how this turned the conversation immediately to things that great video makers do and away from my standards as a teacher. Plus now I have had people in the community talk to me about their energy use and how it can change. Some notes: I know they could do the 90 views themselves. In this case go back to one of my goals, that the student be aware. If they watch their video 90 times, they will be aware. Even if they take the effort of putting it into an automatically rotating play list. Most achieved 90 by posting to their Facebook with they please watch this my teacher made me get 90 YouTube views. Meets my goals and theirs. ]]> Jim Peterson tag:weathertation.posthaven.com,2013:Post/324666 2012-01-18T03:13:00Z 2013-10-08T16:30:57Z What makes you groan during lab presentations? One of my other hats has me thinking about the professional development of all of our teachers 7-12. This is a really fascinating job that is challenging in so many ways I cannot begin to describe it. As a part of that I am part of a group exploring how to better teach writing at the secondary level in a technology rich environment. Once a month this year I am learning about Writers Workshop with a group of volunteers from our faculty. In the workshop model students are expressing themselves within a context that the teacher provides but in their own words and their own context as well. To translate to the physics audience they create their own data from their own questions and then apply general techniques to analyze that data. It is really cool. So here is how all this work with writing has changed my physics class. Every inquiry unit ends with a presentation of the research the students have done. I have put very limited requirements on these presentations, but I do provide an increasing long list of guidelines. I thought to myself, these presentations have not been changing much over the years in spite of me providing this list. So this past unit instead of just spending time going through the list again and giving some time in class to work together on their presentations I picked the two that annoyed me most. Bad procedures and bad graphs. I made a mini lesson about procedure (no more than 7 minutes) and then set them to applying what they learned to their data. Next day same thing with graphs. Results: actual improvement in the quality of presentations. Students even pointed out the improvements in other students work. So here is my question to you: what makes you groan during lab presentations and how can we work together to make a list and improve them, one skill at a time? I am a member of the Yahoo PowerSchool User Group and learn a ton from it each day. Have you joined any Moodle User groups that you would suggest? I mainly do two things. First, I subscribe via RSS to the moodle.org forums that interest me. Second, I also subscribe to this moodle RSS feed bundle. That bundle might seem like too much, so the two blogs I always read in the bundle are MoodleNews and Around the Corner. ]]> Jim Peterson tag:weathertation.posthaven.com,2013:Post/324743 2012-01-11T21:57:26Z 2013-10-08T16:30:58Z Twenty-first Century: Now is the time to increase capacity, everyone's capacity. The last two days I spent a lot of time listening to a consultant from ISM. I really know very little about ISM, it was a gift opportunity. I also know little about consultants, I am rather new to the administrator gig and in fact still teach physics for one period a day. So what this all leads me to say is I am not sure what grains of salt to put on what parts of what I learned. I will say this, consultants can say whatever they want and that in and of itself is fun. He started with a presentation on twenty-first century skills. I think about this a lot because my school and my classroom are places where people think these skills are developed. He had a lot of lists of the skills, the most intriguing one was from a presentation that I had delivered a while back that was buried on our website. He did his homework. He went on to say that he thought that twenty-first century skills were something different. They were less skills, because as he pointed out, everyone in the room full of administrators had most of the twenty-first century skills without having been educated then. He thought that the expectations were different in the twenty-first century. I have some thoughts on some of his list, but first he said that the rule for the twenty-first century academic administrator is to build capacity in their faculty. As is so often the case I had never heard it put so succinctly before, but I think this is true. As a Technology Coordinator before and an Instructional Specialist now I have been building capacity in teachers for a long time. However, I wondered in my reflection on the point if it was not broad enough. I wonder if we must all be capacity builders in school, and really in all of our life. All of us need to increase our capacity and the capacity of those around us. Somehow somewhere even those of us who went to college have lost or not maintained the ability to increase our capacity. We want to be told what we need to do to get the job done. I spent probably ten years as a good teacher not changing too much, reflecting for sure on what went right and wrong but not really doing much more than tweaking around the edges. The last few years my curriculum has been new each year and probably not repeatable. This year I am spending time developing units that I know will not be compelling to students next year. I am confident that the experience of making lessons that are reactive, local and relevant will be and awesome tool and open the doors I need open for future classes to succeed. I am building my capacity to respond to the people around me and support them where they are at. Never done. All can improve. No finish line. Schools needs to be a place filled with capacity builders. Administrators need to imagine what their teachers and students could be and support them to be that. Teachers in turn tended to ask their administrators for help building capacity. They need to spur their colleagues on to better capacity and they need to build it in their students. Teachers need to build capacity in their administrators by supporting their work, and helping where needed. Students should be expected to build capacity in all the people around them as well; other students, their teachers and administrators. We will know we are building capacity into our students when they start to build capacity into us. School should be a place where everyone improves. ]]> Jim Peterson tag:weathertation.posthaven.com,2013:Post/324778 2012-01-11T21:36:38Z 2013-10-08T16:30:59Z How do we make the world new? I collect quotes about imagination. I think imagination is one of the most powerful parts of being human. I encourage it in my children, my students and my teachers. I am not sure of this but as I ponder what makes a master teacher I think imagination appears somewhere in my list. A person will worship something, have no doubt about that. We may think our tribute is paid in secret in the dark recesses of our hearts, but it will out. That which dominates our imaginations and our thoughts will determine our lives, and our character. Therefore, it behooves us to be careful what we worship, for what we are worshipping we are becoming. I wanted so to replace the word worship in this quote with imagination. The words are not mine to do that with. And I am sure that Emerson was much more careful in word choice than I am. So here are the questions this quote generated for me. So what do imagination and worship have to do with each other? How do they both contribute to the new creation that the future is? How might we add worship into the curriculum, because certainly I would like my students to imagine and create a beautiful world. Since, as Emerson points out, they will create a new world no matter what how do I get them to use the tools in my class to imagine better, create better and worship better? What other actions create the world new? Do you have any more questions. What new worlds will your students create?